This deck of beautifully illustrated cards uses science-based social skills treatment for children with autism to deliver simple, objective and measurable results. Reactivity allows both parents and professionals to establish the foundations for social skills through a series of cards that introduce children to a wonderful world of playful interactions, designed to develop their interest in relating to people as well as their awareness of the world around them. 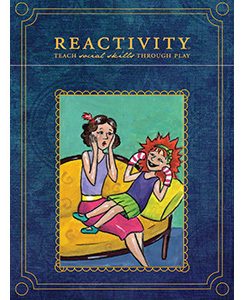 This week only, take 15% off your purchase of the Reactivity: Teach Social Skills Through Play cards by applying the promotional code BLOGRTVY6 at checkout. Reactivity is a wonderful amalgamation of the worlds of play and therapy that is simple and fun to implement while providing short-term observable results. The cards can be used by parents and families, caregivers, behavior analysts, special education teachers, speech pathologists, occupational therapists, psychologists and others. *This promotional code expires on September 17, 2013 at 11:59 pm EST. Not compatible with any other offer. Be sure there are no spaces in the promo code at check out! This entry was posted in ABA, autism, autistic spectrum disorder, Behavior, Daily Living Skills, Difflearn Promo Code, Pick of the Week, Products, Sale, Social Skills, Speech & Language, Transitions by Different Roads to Learning. Bookmark the permalink.